October 11 Update: The zero files for ‘unofficialresult.json’ and ‘unofficialresult-wardbyward.json’ will remain in place until election night, October 22. Run your tests prior to election day! No technical support will be available October 22. Information for technical or production staff of the media outlets who plan to download and access election results on election night. 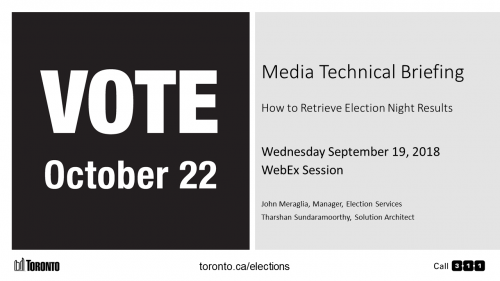 The presentation below highlights how media representatives can access election night results in a machine-readable format for their web sites and broadcasts. Check the ‘Live Results Information for Media’ tile regularly for any new information. Election Results files will be available in a machine readable JSON file format.